The newspaper reports that the tent city houses unaccompanied minors, not children who crossed the border illegally with adults. On Wednesday, President Donald Trump signed an executive order to end the separations — part of his administration’s “zero tolerance” immigration policy — but it was unclear how his order might affect the tent city that has been erected at the border crossing. The site has become a hotbed of protesters in recent days as bipartisan pressure grew for Trump to halt the separations. The border control facility at Tornillo has about 360 teenage immigrants who entered the country illegally, unaccompanied by adults. Federal officials are considering expanding the tent city’s capacity to house as many as 4,000 children. Democrats — including Beto O’Rourke, who is challenging Sen. Ted Cruz (R-TX) in the midterm elections — have marched on Tornillo as if it were housing children who were separated from their parents. “We decided there wouldn’t be a more powerful way to spend Father’s Day than with children who have just been taken from their fathers, children who have been taken from their mothers, children who won’t be able to be with their family,” O’Rourke said on Sunday, according to the Texas Tribune. He had just led a march of thousands of people outside the Tornillo tent city, the San Antonio Current reported. 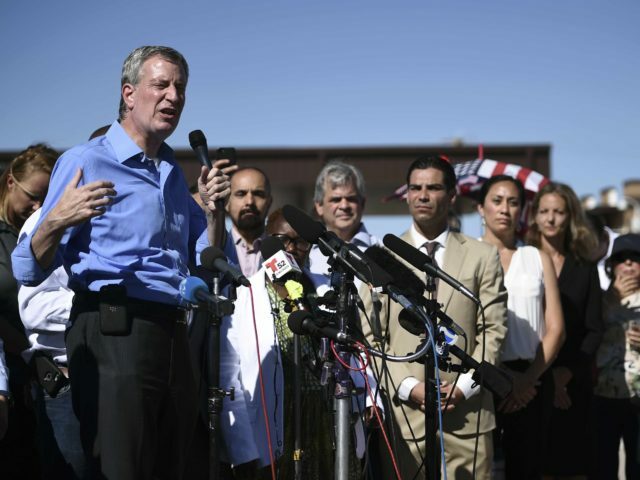 New York City Mayor Bill de Blasio (above) has also protested there, among other leading Democrats from around the country. Department of Homeland Security Secretary Kirstjen Nielsen said Monday that 10,000 of the 12,000 children in government custody had arrived at the border on their own — i.e. they had separated from their parents before undertaking the journey. The Department of Homeland Security has not returned requests for comment.